Two passions combined to form Project Unconditional on a day in 2012 while photographer Jane Sobel Klonsky sat in her insurance broker's office. 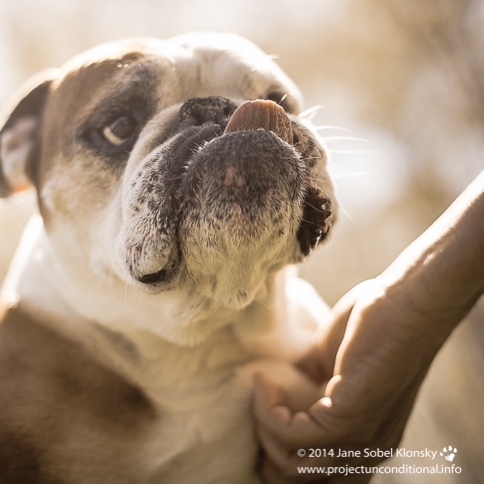 She found herself interested in the special bond that her broker, Angela, had with Clementine, an old Bulldog who came to work with her everyday. On that day, Jane's profession and first passion, photography, fortuitously melded with her love of dogs, as she discovered a desire to document the connection between dogs in the twilight of their lives and the people who love them. 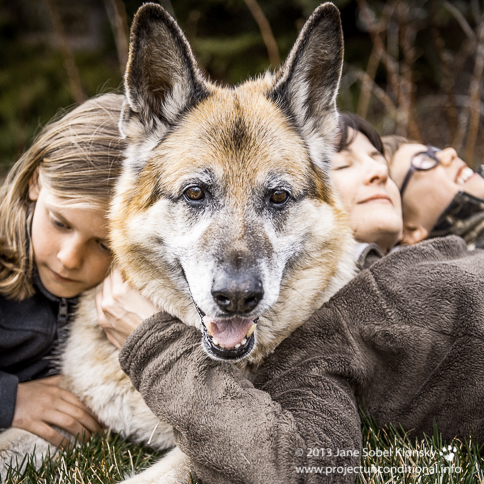 What developed was a collection of photos and stories capturing the unconditional love we share with our older dogs. Here are some excerpts from those stories. Subscribe to the Project Unconditional newsletter to get the latest news, events and promotions. 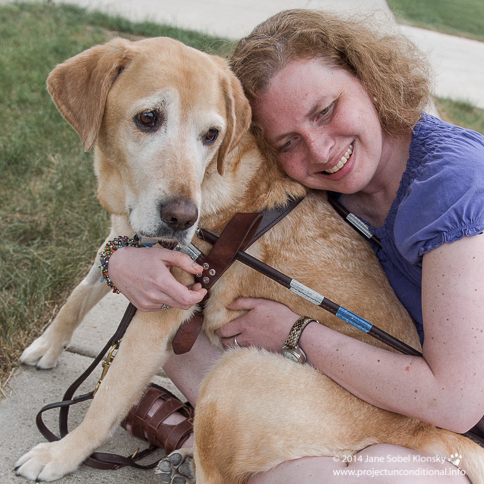 "I have had the privilege of sharing the experiences of these special people and their rescues, service dogs, working dogs and lifelong family pets. They are big dogs, small dogs, fluffy dogs, and hairless ones, some lapdogs and those who think they should fit on your lap." 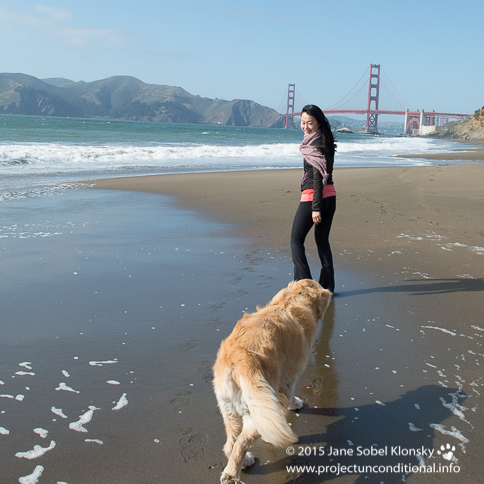 Project Unconditional is for all who appreciate the connection, unconditional love, and bond that a canine companion provides. 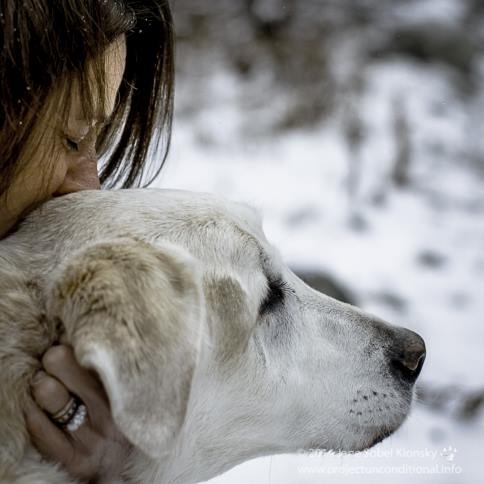 It’s for those who can’t imagine life without their beloved dog. It’s for all the people who have lost their dogs, who don’t want to get another because they just aren’t ready yet. It's for the people who love dogs but haven't yet had the chance to bring one home. Through stories, photographs and film, Project Unconditional has documented the relationships of more than 300 senior dogs and their human partners. It is a beautiful reminder–both wistful and vibrantly hopeful–to cherish our older animals and the rich moments we have with them, and to thank them for the love and friendship they unconditionally offer us. Jane Sobel Klonsky (pictured with her dogs Sam and Charlie) launched her photography career in 1976 as the first photographer to scale the cables to the top of the Verrazano Bridge to get a shot of the start of the New York City Marathon. Jane was the official photographer of the New York City Marathon for the next 10 years. For nearly thirty years, Jane was a major player in the world of commercial and sports photography, with clients including Adidas, Black & Decker, Club Med, Pepsi, Nike, Coca-Cola, Xerox and Miller High Life. Her work has taken her around the world to Kenya to shoot photos of a family of Masaai Warriors; to record an international running competition in Tokyo; and to chronicle the untouched beauty of far-reaching places like Papua New Guinea and Myanmar (Burma). Known for her award-winning lifestyle photography, as well as for her work in fashion, travel, landscape and sports, her work has been published widely, and has been the subject of several books, including one based on a 50,000 mile cross-country photographic tour of rural America taken with her photographer husband, Arthur, and two Great Danes. She continues to do extensive work for Getty Images. Mother to up and coming filmmaker, Kacey, she lives with her husband, their two therapy dogs, Charlie and Sam, and a cat, Humphrey, in rural Vermont. Kacey Klonsky is a filmmaker and photographer with a mission to capture the beauty of life and tell the stories of those around her. Since graduating from NYU Tisch film school, she has worked in video production and as a photographer. An outdoor enthusiast based in Portland, Oregon, Kacey can be found looking for snow in the mountains or traversing the Pacific Northwest seeking adventure, always with a camera in her hand. For more about Kacey's other projects, visit www.kaceyklonsky.com.